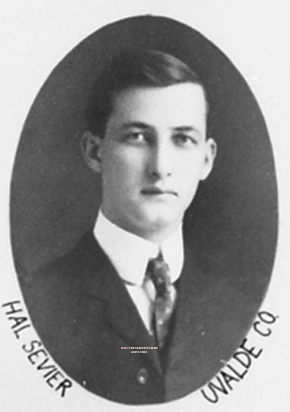 Henry Hulme "Hal"Sevier. Courtesy of the Legislative Reference Library of Texas. Image available on the Internet and included in accordance with Title 17 U.S.C. Section 107. Clara Driscoll Sevier. Courtesy of the Library of Congress. Image available on the Internet and included in accordance with Title 17 U.S.C. Section 107. SEVIER, HENRY HULME (1878–1940). Henry Hulme (Hal) Sevier, newspaperman and diplomat, was born on March 16, 1878, in Columbia, Tennessee, to Theodore Francis and Mary Benton (Douglass) Sevier. His paternal forbears were among the early political and military leaders of Tennessee, and his mother was a native of the Republic of Texas. Sevier's father served as a lieutenant colonel of Confederate forces during the Civil War and was an organizer and early administrator of the University of the South in Sewanee, Tennessee. Sevier was educated by his father and at an early age became interested in politics, economics, and law. He moved to Uvalde County, Texas, in 1895 to become the publisher of a weekly newspaper, the Sabinal Sentinel, and soon attracted the attention of such Democratic leaders as John Nance Garner. In 1902 he was elected to the Texas House of Representatives, where he served two terms. He moved to New York City in 1906 and was financial editor of the New York Sun until 1912. He married Clara Driscoll, a well-known philanthropist and businesswoman from the Corpus Christi area, on July 31, 1906, at St. Patrick's Cathedral. For several years Sevier was a cotton merchant in New York City. In 1914 he returned to Texas and became the founder, owner, and editor of the Austin American. Sevier stayed with the paper until 1917, when the United States entered World War I and he was asked to be a member of the Committee on Public Information. He was sent to Argentina and Chile to counteract enemy propaganda against the United States. At the close of the war he was detailed to Paris to assist his personal friend Col. Edward M. House, President Woodrow Wilson's representative at the peace conference. From Paris Sevier made a special trip in an open-cockpit airplane to Czechoslovakia to confer with Edvard Bene_, who later became president of the new country. For some years thereafter Sevier traveled extensively and devoted much time to writing articles on political and Latin-American topics. In 1933 President Franklin D. Roosevelt appointed him ambassador extraordinary and minister plenipotentiary to Chile, and he continued in that post until 1935, when ill health forced him to resign. Two years later his thirty-one-year marriage ended in divorce. In addition to his other activities Sevier was chairman of the Uvalde County Democratic Executive Committee for several terms, first president of the Austin Public Library Association, and a member of the Masonic order, the Woodmen of the World, and the Protestant Episcopal Church. He died at Chattanooga, Tennessee, on March 10, 1940. Austin American, March 11, 1940. Martha Anne Turner, Clara Driscoll (Austin: Madrona, 1979). Handbook of Texas Online, Dorothy D. DeMoss, "SEVIER, HENRY HULME," accessed April 19, 2019, http://www.tshaonline.org/handbook/online/articles/fse12. Uploaded on June 15, 2010. Modified on October 18, 2017. Published by the Texas State Historical Association.